Murney Tower Historic Site offers an insight into Kingston's extensive military heritage. 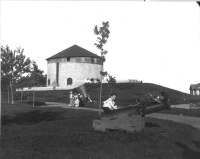 As part of the Kingston Fortifications, history comes alive inside one of the four original towers built to defend Kingston and the Rideau Canal. Murney Tower is now closed for 2017. We open again on the Victoria Day weekend 2018, and look forward to seeing you then! the museum and its artefacts. ​Service Animals: All service animals are welcome. free and any other supervisors $5 as per the usual admission prices. Murney Tower is a multi-level building accessable by staircase only. Due to the historic nature of the museum the heart of the building has all of the original flooring which is uneven in certain areas. Washrooms: Currently the washrooms are NOT fully accessible. Accessible Parking: The parking lot at our site has one accessible parking spot. If you have any questions or comments regarding accessibility at the Museum or for more information contact us and we would be happy to help plan your visit.